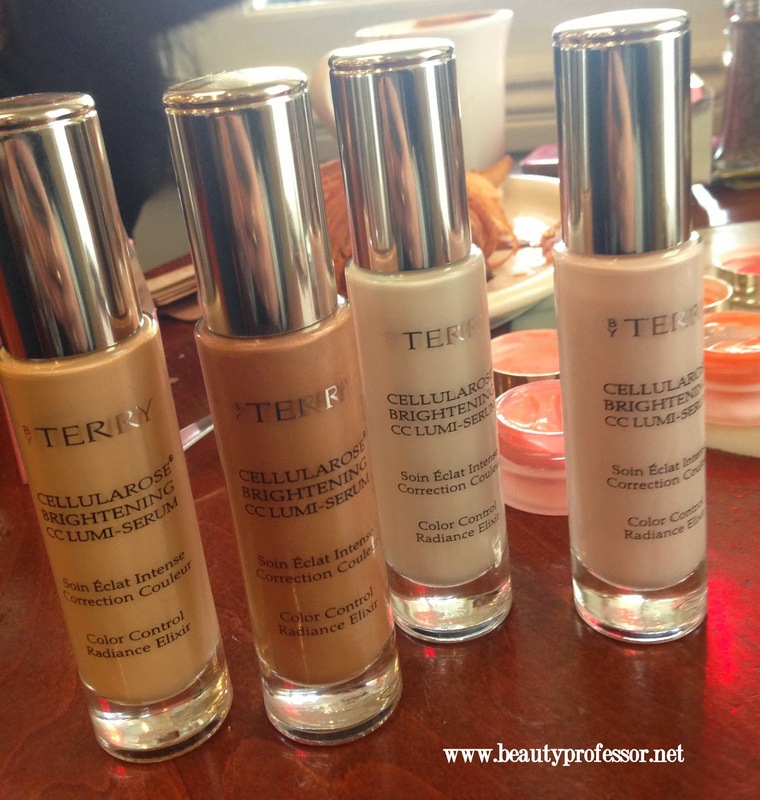 Beauty Professor: By Terry Spring 2014 Collection...Preview + Swatches! 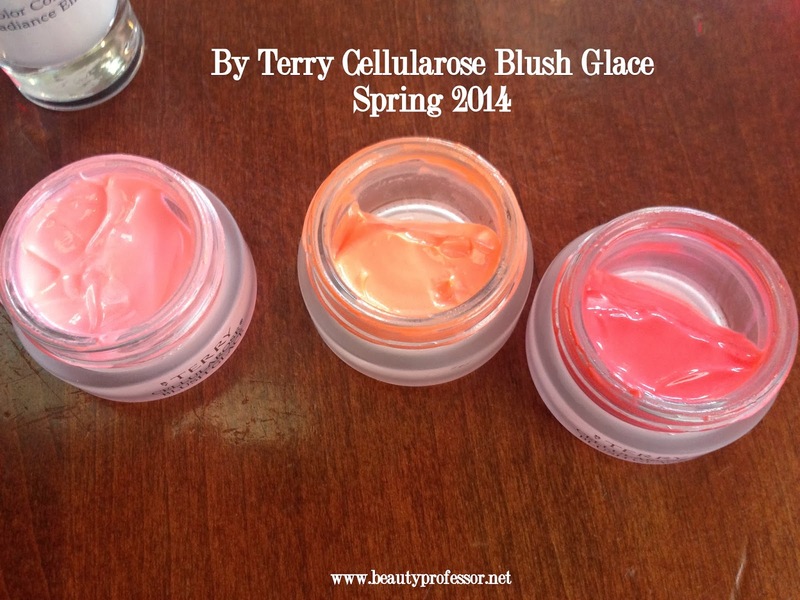 By Terry Spring 2014 Collection...Preview + Swatches! Above: The By Terry Spring 2014 Collection. Earlier this week, I had the distinct pleasure of meeting with By Terry US National Sales Manager, Marissa Tan Sanchez. Our lovely coffee time at the Beverly Hills Urth Cafe was filled with marvelous conversation and an exploration of the entire By Terry Spring 2014 Collection. Above: BP and the beautiful By Terry US National Sales Manager, Marissa Tan Sanchez. 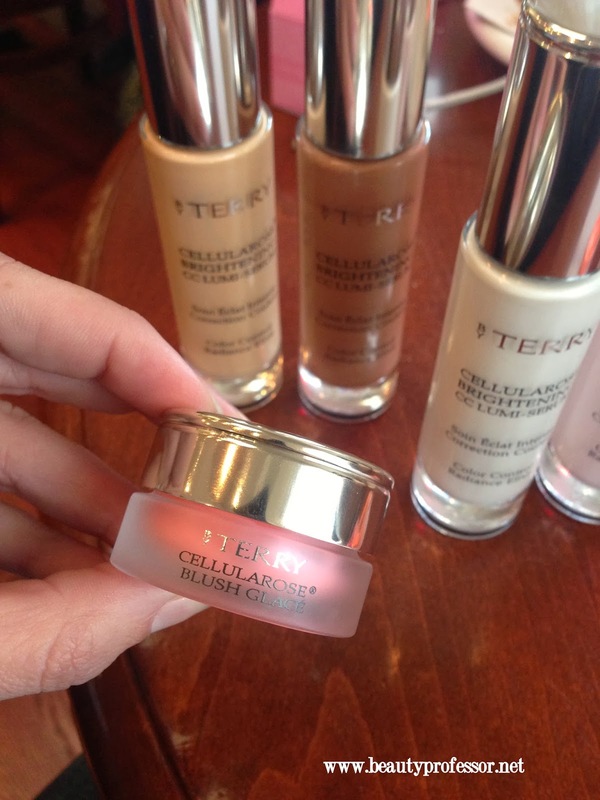 Above: The Cellularose Brightening CC Lumi-Serum is a primer, illuminator and color corrector in one! 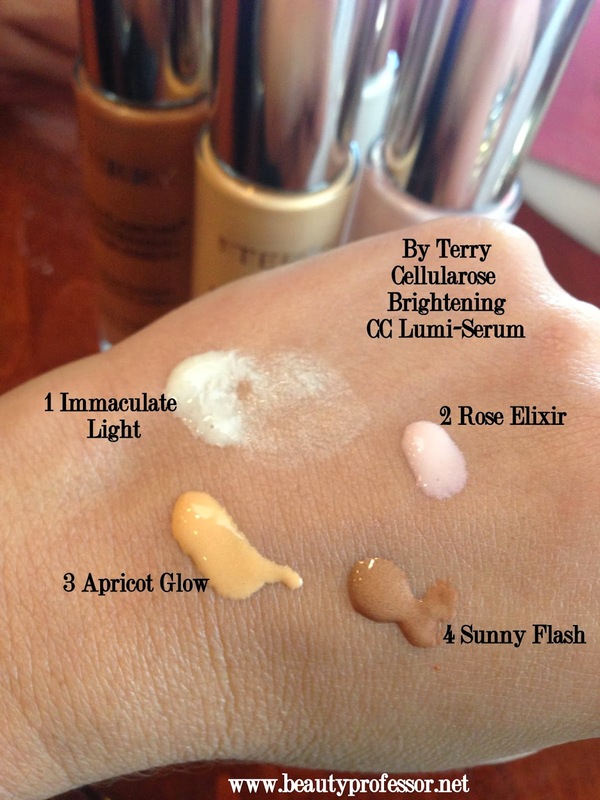 First up, the By Terry Cellularose Brightening CC Lumi-Serum...this primer of sorts comes in four shades of gorgeousness and is intended to smooth, plump, brighten while simultaneously blurring imperfections! White native rose cells and the I.P.G Complex work together to nourish and brighten skin from the very first application...during the swatching session, I easily ascertained that this formula is silky, smooth and sheer with an extremely sophisticated glow. Above: Immaculate Light and Rose Elixir. Above: Apricot Glow and Sunny Flash. Above: Initial pumps of all four shades. 1 Immaculate Light is a bright golden white that controls redness, tackles dark spots and enhances a fair to light complexion. 2 Rose Elixir is a very light iridescent pink that will add a youthful glow and brightness to dull complexions. 3 Apricot Glow is a universally flattering radiance enhancer for light to medium skin tones. This warm golden yellow is the shade I hope to try first hand! 4 Sunny Flash adds a hint of warmth to light skin tones and brings welcome radiance to medium and dark skin tones. 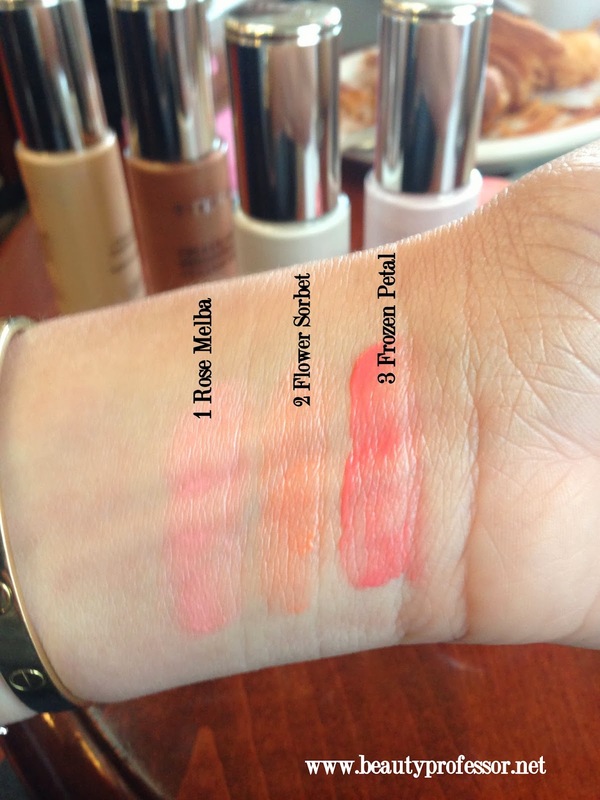 Above: Swatches of all four shades post-blending. Above: The Cellularose Blush Glace...a silky, light cream-meets-gel. 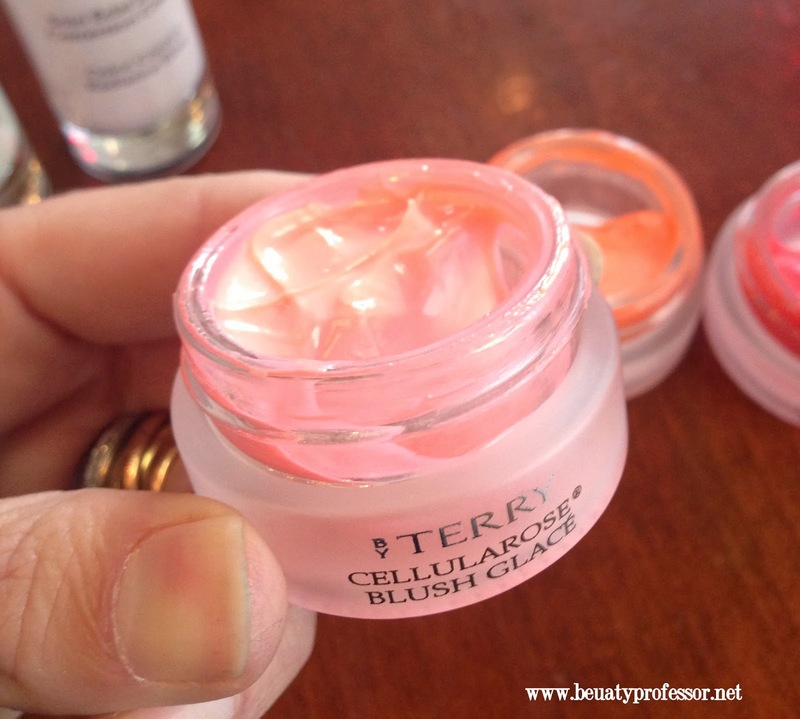 The By Terry Cellularose Blush Glace is a moisturizing gel blush with a light, transparent finish that brings color and radiance to the face. It is pigmented, yet completely wearable and contains vitamins and hydrating phospholipids that deliver skincare benefits while adding a gorgeous flushed glow. The texture is unlike anything I have ever encountered before and I am completely smitten with Rose Melba! Above: The Blush Glace comes in a 7ml frosted glass jar. Above: Ahh...Rose Melba...a must for baby pink lovers. Above: Swatches of all shades. 1 Rose Melba is a delicate, baby doll pink. MUST have this in my life. 2 Flower Sorbet is a warm apricot shade that brings a soft, vibrant glow to the face. 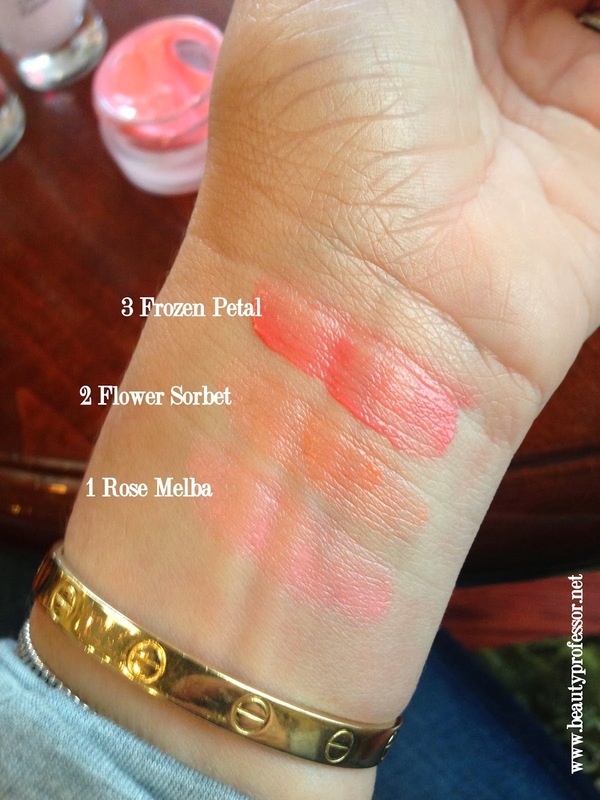 3 Frozen Petal is a bright reddish-pink flush...very natural when sheered out! Above: One more round of swatches! Above: The By Terry Baume de Rose 10th Anniversary Edition. 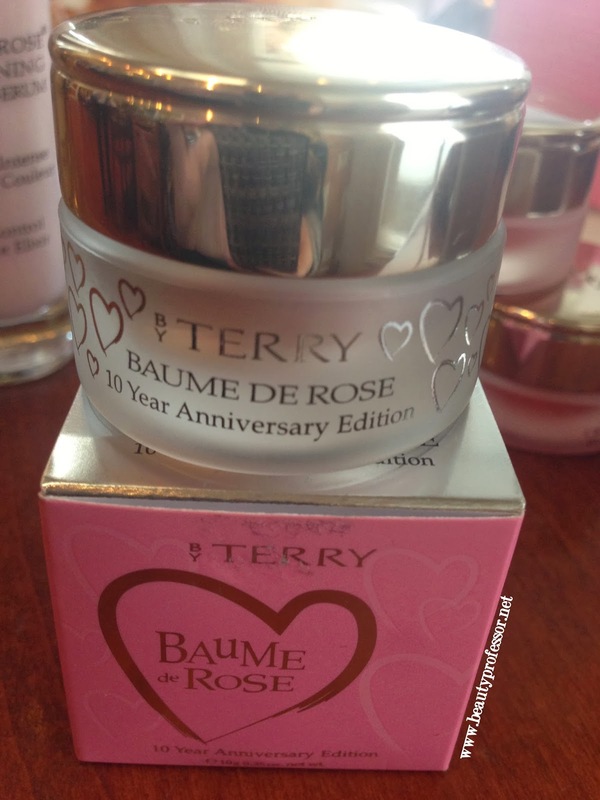 2014 also marks the 10th anniversary of the By Terry cult favorite, Baume de Rose. In celebration of this milestone, this silky, ultra-hydrating balm comes in limited edition heart-embellished jar...truly special! **The 10 Year Anniversary Baume de Rose can be purchased in the commemorative jar and as a set with a correlating lipgloss at Barney's NY. 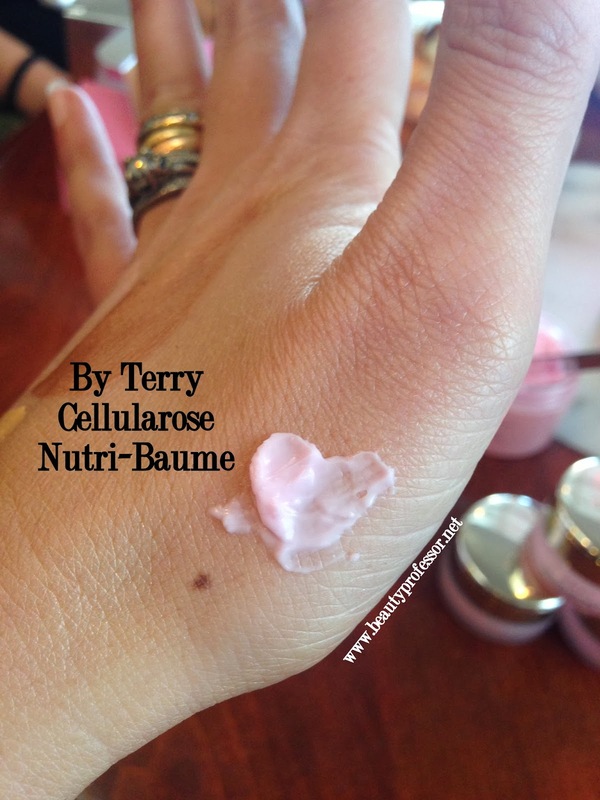 Above: The Cellularose Nutri-Baume comes in a 30ml frosted glass jar. 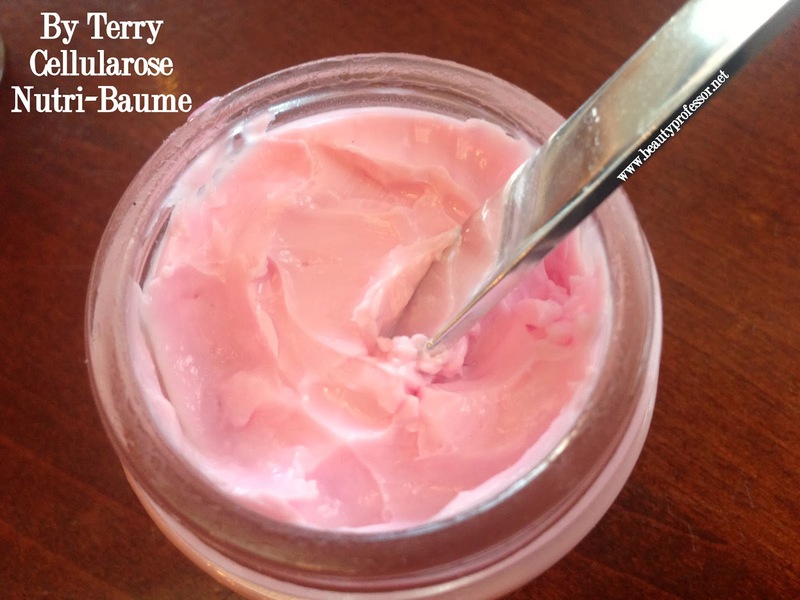 Finally, the By Terry Cellularose Nutri-Baume is a multi-purpose, soothing and repairing formula that nourishes and balances skin exposed to harsh environmental conditions. It is rich, creamy and dense (though it absorbs quickly), enabling the tiniest amount to completely moisturize the skin. I love its multi-faceted capabilities and ambrosial rose scent...completely intoxicating! 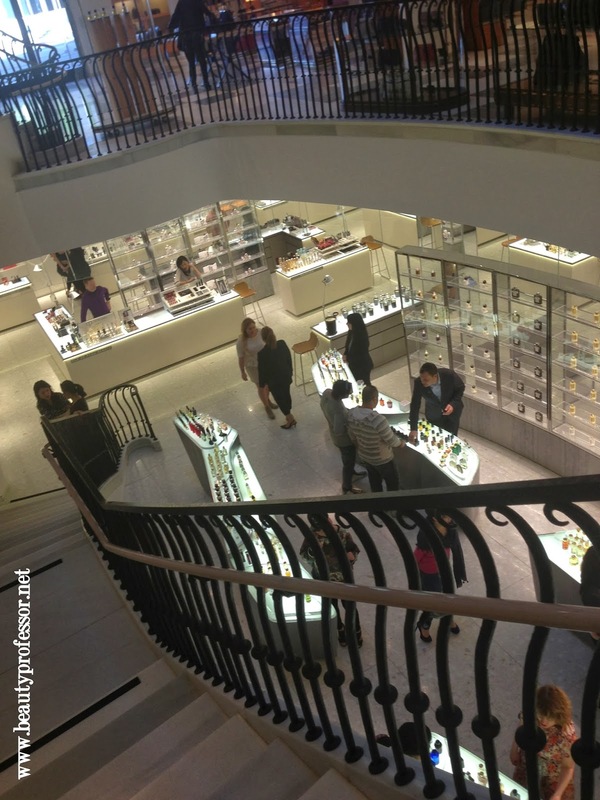 Above: Directly following my meeting, we had the chance to take a quick stroll through the stunning, recently-remodeled Foundation floor of Barney's Beverly Hills (I had to get back home to teach a class, so time was not on my side!). I cannot wait to go back when I have more time! Above: We also stopped at the Dina Collection (down the street from the Urth Cafe). If you've ever watched "Beverly Hills Pawn" (a guilty pleasure for my husband and me), you likely know the significance of this store! Feeling like a fan-girl in this pic. Bottom Line: I am so thankful to have been able to experience these incredible releases first-hand this week...historically speaking, By Terry line does not disappoint and this collection is no exception. I cannot wait to try the Cellularose Brightening Lumi-Serum in Apricot Glow and the Cellularose Blush Glace in Pink Melba in my beauty routine and will weigh on my experience once I have! Oh my...I must have rose melba! It looks so sophisticated (I'm assuming it's shimmer-free from the swatch). I've never seen this texture in a blush before...you have to share how you would apply this! I would assume something like a beauty blender? But I wouldn't know...I'm not big on using my fingers for pretty much anything (strange, I know, but I have this weird fixation of not touching my makeup with my fingers except to highlight my inner corner of my eyes). What a gorgeous lot if swatches. The primers look delightful. I will be keeping my eye out for them. I have been faithfully reading your blog of late but have been struggling to find the time to comment due to the kids being back to school and the early mornings have taken some getting used to again!! I would love to try the Surratt finishing powder you reviewed it looks Devine. My husband and I both enjoy watching Beverley Hills Pawn! It is a guilty pleasure indeed. Thank you so much! It is lovely to hear from you and I understand how the hectic nature of life can make it difficult to comment...glad to know you're still reading ; ) Early mornings are dreadful!! Yes, I hope you can get your hands on the Surratt powder...it's incredible! Love that you and your husband enjoy Beverly Hills Pawn too...such mindless good clean fun, no?! Fabulous! I would love to meet with a brand to play with goodies! Especially by Terry! I just included a by Terry product in a write up! Thanks, Laura...yes, the By Terry line is insane and is always a total treat for me to explore! Ohhh wow!!! They all really look amazing. I have been waiting for their release for some time now and I love them all!!! Especially Sunny Flash Brightening Serum and Rose Melba Blush. Sadly I have a little beauty detox now as I have bought far too much last month!! This collection is exciting, indeed!! Hope you get a chance to try them when your detox is over ; ) Springtime is always such a tempting time for makeup collections! Because we like the same things - There are SO many new products for you to try! 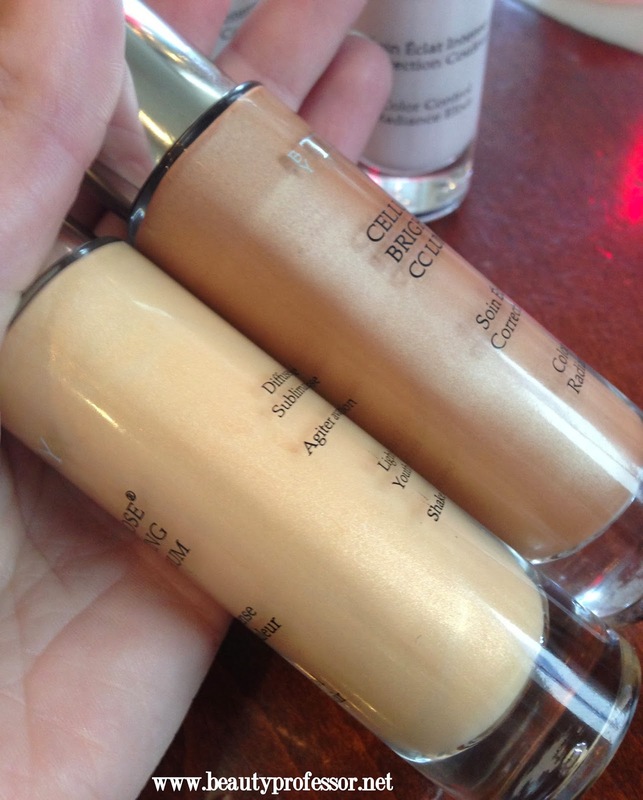 the new becca ultimate coverage foundation is LOVE! Apply with the one brush and you will gag. Skin like but covers all! Also, dior's new dream skin - ahhhh! Its a game changer! And Urban Decays new loose powder - YOWZA. Im wearing it with the aforementioned products and I look airbrushed and trust me I am SO NOT! Thank you for the suggestions...you have totally piqued my interest in the Becca foundation and the Dior Dreamskin...will be looking at both soon!! Rose Melba looks absolutely dreamy! I love the idea of a transparent finish in a blush. I only want a the tiniest amount of added color so I'll have to give it a try. In the jar it literally looks like it's glowing. Good to hear form you! Yes, the Rose Melba is such a gorgeous shade...pigmented yet light and transparent...so dreamy! Can't wait to hear your thoughts once you try it...xoxo and talk soon! Hello! How I have missed commenting on all of your wonderful recent posts! It's been a mad house here including colds for all, new crawler and stand-to-puller, and life in general! :P I simply had to find the time to comment on this gorgeous gorgeous post! I adore By Terry! I use the Densiliss foundation every time I want to be sure I look my best, and now I want to try...no, I MUST try the Brightening Lumi-Serum! It seems like it would give the foundation a more glowy look which is always a plus! Of coure, the Rose Melba is clearly a must as well! Can't wait to see it on you! Hope all is well on your end, and I can't wait for more of your posts! They always make my day and give me much to lust after! Lovely to hear from you! It does sound like you indeed have you hands full right now ; ) I am honored that you took the time to share your feedback on this post...thank you! The Densiliss is magnificent...right now, I have to mix it with something a bit lighter in tone (the KGD Aqua in 213) since I am at my "dead of winter" palest. The Brightening Lumi-Serum is magical, no? I practically gasped when Marissa put them on our table. Wow! The Rose Melba is equally scintillating...so pale and pink and instantly one with the skin. Cannot wait to get it! I hope that your cuties (and you and the husband, of course!) stay well and healthy and look forward to chatting soon, my friend! Oh my goodness! I've never tried anything from this line,but I have to say I should spend a little more time checking it out. Especially since SpaceNK is so close. Rose Melba does look beautiful! I just can't imagine putting that texture on as a blush... I love the name 'frozen petal!' I always am very appreciative of all your swatches, thank you! The blush texture is amazing...light, creamy, blendable and glowing...completely unique but wonderful! Glad you like the swatches! Hi! I am very grateful that you have done reviews on By Terry. If you can, would you be able to find out if By Terry would be sold in Canada? It used to be sold here, then discontinued. I never had the opportunity to buy the balm because it was always sold out, but I did get the blush and so beautiful. Really looking forward to try the new blush, get a jar of rose balm, try their loose powder and the concealer. Thank you! I adore the By Terry line and love covering it as much as I can. I am fairly sure that you can purchase By Terry online at Net-a-Porter (one of my favorite retailers; for reference, the link to it is found on the right side of my blog!) because they ship to Canada. All of the products you mention are on the site right now! Which moisturizer do you use under the Cellularose Brightening CC Lumi-Serum ? I was hoping I wouldn't need one but it seems I do! 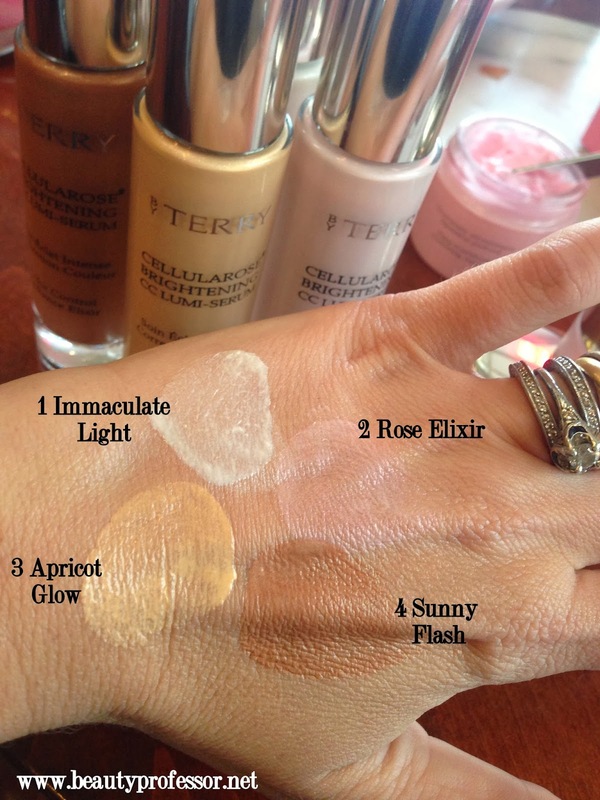 I use the Le Metier de Beaute Peau Vierge as a first step and then follow with the By Terry!